If you have not already created a DigitalOcean account, use our referral link to do so: https://m.do.co/c/39937689124c. DigitalOcean will give you $100 of credit to spend during the first 60 days so that you can try things out. Once you have spent $25 with them, we’ll get $25 to put towards our hosting costs. Log into DigitalOcean and create a new Droplet. Select the distribution for your new Droplet: Select the option 18.04.x x64 from the Ubuntu box. Choose a size fit for your intended usage. The $5 Standard Droplet should be enough for light Aggregate use. 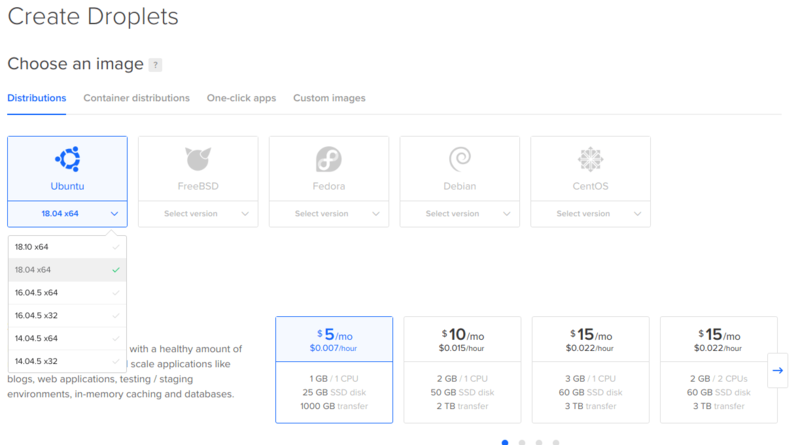 If you find yourself needing more, DigitalOcean makes it easy to resize to a bigger Droplet. If you would like automatic weekly backups, enable them. You will not need block storage. Choose a datacenter region physically close to where data collection is going to happen. Under Select additional options, check the User data checkbox. Copy and paste the contents of this Cloud-Config script. In the Choose a hostname section, enter the domain name (e.g., your.domain). This hostname will be used by the Cloud-Config script to configure your server’s HTTPS support. You will not need to add public SSH keys (unless you know what that is and you want to). Click on the Create button. The Droplet takes a few seconds, the actual Aggregate installation will take up to 10 minutes to complete. Once the Droplet is running, take note of its public IP address (e.g., 12.34.56.78) and set a DNS A record pointing to it. 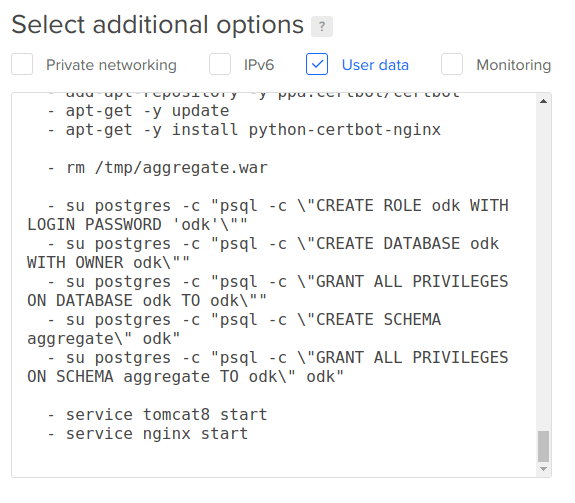 From the DigitalOcean Control Panel, click the name of your droplet, then select Access from the left navigation. Click the Launch Console button to open a web-based console session. When the console opens, click the console screen, and at the login prompt, enter the user: root . Your password will be the root password that DigitalOcean emailed you. If you do not have the root password, click the name of your droplet, select Access from the left navigation and choose Reset the root password so that a password gets emailed to you. You may also login over SSH using the ssh root@your.domain.